Roedde House Museum in Vancouver, British Columbia. Past performances in the Vancouver, British Columbia area include with City Stage New West, Presentation House Theatre, Christ Church Cathedral, Hycroft Manor, and as a benefit for P.A.L. Vancouver. East Coast venues include The Colonial Theatre and as a benefit for the Tillotson Center in northern New Hampshire. Special thanks to Deborah Wright Houston, Melissa Haller, Sean Allan, and Richard Newman for contributions to direction. Step into the parlour for tea and town gossip with the brilliant, witty, and enigmatic 19th century poet Emily Dickinson, The Belle of Amherst. 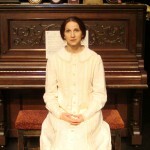 This multi-award-winning one-woman play based on the reclusive genius’ writings and poetry features actor Renée Bucciarelli, whose work has enjoyed past praise from The New York Times. 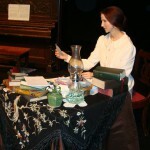 The Roedde House Museum, a special piece of local history that was home to Vancouver’s first bookbinder, provides an ideal period setting for Emily Dickinson’s seemingly fathomless exploration of words, of a vibrantly-lived inner life, and of love. 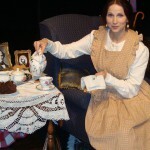 Audience members of this intimate performance will find themselves transported back to an elegant time, in an ambience complete with period music played on the parlour piano, tea served in china cups, and even Emily Dickinson’s famous ‘black cake’. Come find out why Emily Dickinson has inspired countless plays, novels, children’s books, contemporary poems, dances, performances, and artworks, as well as over 1,600 musical compositions, a Simon & Garfunkel song and, more recently, a chart-topping rock album by Italian singer/supermodel (and former French First Lady) Carla Bruni-Sarkozy. Of Miss Dickinson’s boundless ability “to have made all things new” renown literary critic Harold Bloom has pronounced “The Myth”–as she was called in her time–an equal to Shakespeare. More pictures and nice things people said on Facebook: Emily Dickinson at Roedde House.